"Look no further honest, & wonderful sevice ,my neighbor told me about them & he was right!!!!" "They are the best! I respect and trust Gary's service advice. He makes sure that I understand the extent of the service he is recommending and why a particular service is necessary. Aside from one starter issue which they fixed pretty easily, I am there mostly for preventative maintenance. He runs a really good, clean shop and he has has a great crew. I have never had a problem with any of their work. They are also very accomodating with rides and scheduling appointments." "I would compliment the cleanliness and professionalism of the place Great customer care and a job and price one can depend on"
"Very precise. I knew everything wrong with my car and it was all written out. Very friendly." "Exceptional service, extremely efficient and always treated like family!" "They are a great shop with knowledgeable and professional staff. They are also courteous and friendly. Importantly they are honest and trusting which is very important to me. They follow up with a phone call and a written one too. I would highly recommend them to anyone." "Excellent service and very accommodating to customer and customer's need." "Outstanding. Very easy to drop car off and pick it up." "I would tell them I have been going there for years and always find the service friendly and very satisfactory." "Gary is a top notch professional manager who makes customer satisfaction a top priority"
"I always recommend Breezy Point"
"I was very satisfied and like the folks who work there a lot. I really appreciate the rides to and from!" "I would tell them that you can always trust the people at Breezy Point.. They know their stuff and will never recommend work on your vehicle if it was not needed." "excellent service and staff. Support local merchants in town, not the chain automotive repair services." "I give it a !0. Wouldn't consider going any where else. Everyone is so accommodating and friendly. Always willing to go out of their way to help you out!" "Always repaired in on time and the price quoted is what you get. The staff is always pleasant, friendly and easy to deal with. Outstanding service." "I would tell them not worry and have there car serviced there." "The service was explained in a friendly and polite manner. Extra items that could be corrected were explained after the general inspection and completed after calling me at home. Car is running well. I'm happy." "Very pleased with service, friendly and honest. Really appreciated the ride!" "Clean,neat,professional operation.Job done correctly first time.Ok to send wife alone." "Highly recommend. If it's not broken they don't try to fix it! Staff are mostly long term employees. Did a diagnosis and called with an estimate b/4 starting work on vehicle. Prices were affordable and every care was taken to fix my car in a timely manner. I'm very happy with results. ☺"
"I have always been very satisfied with the repair work and the customer service I have received. All the employees are friendly and professional." "We are extremely satisfied with the work they did. They are thorough and did a great job." "I highly recommend the shop. I have been coming here for years. I feel like they treat me like family." "I would tell them that the people at Breezy Point Auto Repair and fantastic! The work done is completely thorough and professional. I will go back to them with all of my cars and refer my friends and family to them." "The service is always top quality. Never a problem." "Top quality car and customer service 100% of the time. Honest and reliable." "I would advise any prospective customer that the quality of work at Breezy point is good and has been with respect to each and every assignment that I have entrusted to their care. I have a high end SUV with unique and even difficult repair requirements. 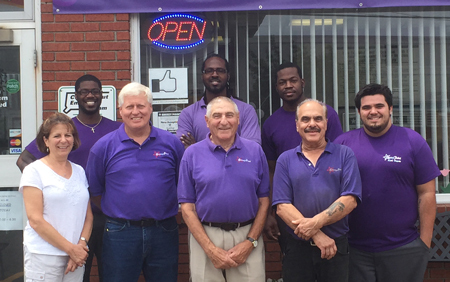 The staff at Breezy point has proven that they are more than qualified to handle car repairs at this level. I will continue to work with Breezy Point." "Amazing Customer Service - The staff is personable, courteous and friendly! Certainly get the family feel when you visit Breezy Point ~"
"That there work is excellent & people are friendly." "Great, organized, clean, alive group"
"Friendly, professional service, reasonable prices, very nice folks. I would highly recommend." "I would highly recommend Breezy Point. Fair pricing, honest and high quality workmanship!" "Take your vehicles there. Courteous, efficient, and handled the problem asap. Good solid work ethics." "Very professional and timely service." "I would highly recommend. I find the staff to always be courteous and welcoming. They listen to your issue and I find them to be genuinely concerned about what’s going on with the vehicle." "Very professional. The shop and employees are well organized. Dave and Jules are true professionals, they took care of a problem I had been having with an older vehicle not passing emissions and had it repaired in 3 hours." "Gary and his team go above and beyond to satisfy their customer! Would never go anywhere else." "Very kind staff, always a perfect diagnosis and recommendations of future work needed"
"I have always recommended Breezy Point." "Excellent,honest service . The staff was knowledgeable and pleasant. Will return for my automotive needs"
"I have been servicing my Ford Taurus at Breezy since 2014. Just recently I took my car twice to their shop: once for a full brake job, three days later for a failed coil pack. Both times the car was fixed in a record time. Breezy delivers 100% in customer service/satisfaction and the speedy repairs. My car is my business, and when it breaks I need it fixed fast, I go to Breezy Point. "very efficient and knowledgeable ..they keep you inforned about the cost and exactly what they are doing to fix your car.."
"Exceptional! App't was for early morning. The mechanic promptly took the car and worked on it. In approximately 45 minutes, I was on my way home." "The quality of work is as good if not better than if I had gone to a dealer. What needs to be done is explained to you and the estimate given comes within reason after completion of the work.I normally do all my own work, but when I can't... I trust Gary and his team to do it for me." first class service facility, repairs done in a timely fashion, even in an emergency. top notch staff. do not prefer national chains, support your local folks!!" "Highly recommended. Trustworthy, knowledgeable, friendly and fair"
"Always a complete and thorough job." "excellent customer service, professional stAff and knowledge of profuct." "EXCELLENT! SUPERB! RELIABLE! HONEST! Everyone is wonderful to work with - we would never go anywhere else." "Quality of work is excellent and very satisfied with customer service." "That the whole team is very professional, and Trustworthy. I would recommend Breezy Point to all my friends and I do. Keep up the great work." "The work and pricing are excellent. I would highly recommend and I have to friends." "I highly recommend Breezy Point. All personnel were knowledgeable, kind and courteous. We were on a road trip and our car died. I looked for a reputable mechanic in the area and found very high praises for Breezy Point. They DID NOT disappoint!!! Breezy Point diagnosed the problem, explained the options and had us back on the road by the next day without overselling or overcharging us. If I lived in the area, they would be my mechanic for life. Thank you Breezy Point, for being respectable mechanics and one people can trust! I can't say that for many mechanics I have encountered." "Great work and fair prices. Very nice staff as well"
"Especially courteous. Quality to notch"
"Yes! The team at Breezy Point is very professional and they make your concerns theirs. I'm very pleased with the service." We live in Lordship and you are close by. I have had my emissions done at your shop before but this is the first mechanical work you and your team have performed. I want to thank you for your professionalism and courtesy. On yes, the car runs great. "World Class Service provided.That says it all! In this day & age its all about the ''BIG BOX" shops, at Breezy Pt. you are given that extra touch & knowing the service being performed is by highly trained professionals. I prefer to support the independent businesses in Stratford." "outstanding work, thorough and trustworthy"
"That I have been pleased with their service and the friendliness of all the staff." "That I have trusted Breezy Point with my cars for 30+ years." "I trust them to do a great job every time. Gary and the guys are great. They kept my 11 year old Nissan humming." "All work is done with the utmost quality. Very curtious , and professional people, with your concerns and repair. I always recommend Breezy Point to my friends, and fellow co-workers." "I wouldn't have my vehicle serviced any where but Breezy Point. Excellent Customer Service and Quality care." "I was satisfied with the repairs performed and the time taken to complete them. Everyone at the facility can be trusted to give an honest and fair evaluation about the work being perform on your vehicle." "I was very satisfied with the work done on myb2006 Toyota Highlander at Breezy Point Auto Repairs. My car is running better than it has in a year. I appreciate the honesty and friendliness if everyone there and it was a pleasure to do business was with them." "I would recommend Breezy Point highly to anyone in need of service. As a matter of fact,i already do that with anyone who discusses their auto repairs to me. I wouldn't bring my vehicle to anyone else." "High quality work done right the first time." "I always recommend Breezy Pont"
"Service is always professional, done right, and on time." "I would tell them that their service was excellent and that everyone I had spoken with was very helpful and courteous. They didn't push any services I didn't need for my car. I'm very happy I found an honest mechanic." "I highly recommend Breezy Point. They listened have always listen to my concerns, address and repair the problem to my satisfaction." "Competent group, courteous and always very helpful when I need a ride back to work. .Pleasure to deal with." "Timely reliable service with great communication." "they are excellant....on time, know what they are doing and explain it to you..even pick up and dlivery service...as a courtesy..i had an emergency with my car and they took it in, fixed it on a really busy day and delivered the car to me.....thank you so much..."
"I was happy with the service and they should try them"
"Do not wait they are the best not the most expensive,,nor cheap. But there work is far better then you could ask for. As for customer service they beat all so when you are tired of the rest go to the best." "Very professional, courteous and thorough service. Estimates are spot on, repairs are complete and customer service is outstanding." "I would and do recommend having their car serviced at Breezy Point. Gary and his crew are straightforward and honest and do not take advantage of their customers. They all really care about the quality of their work and are also very fair." "Outstanding customer service, clear explanation of services, top notch work and a comprehensive overview for long-term care and maintenance." "Very honest and great service"
"Very satisfied with work. And was done in a timely manor"
"I would definitely refer friends. I felt very comfortable discussing what my car needed done and I feel the prices are very fair compared to other garages I have been to. Not easy for a girl to find honest people to help with car repairs!!" "Very satisfied with work done II am a repeat customer and I can depend on a ride to and from work when needed All of the staff is very professional I am amazed how organized the garage is and the office runs smoothly. I do wish the hours were until 7:30 to 5:30 and Saturday until 1pm." "I would tell them that Breezy Point Auto Repairs, Inc. provides the best quality workmanship!" "Very happy , even though I had to junk my van . All I want is fairness , honesty , and nice people to deal with . I received all 3 !!! Would highly recommend and solely use their services ." "go there, which i have done many times...."
"The staff is very polite and explains all the issues with the car. I am usually able to get a ride to and from work or home by a staff member. The office is very organized and the one time I picked up my car and had not paid the bill because the office closed before I was able to retrieve my car, you billed me with out any issues. I am glad that you were recommended." "Great customer service! They are friendly and even can give you a ride home if you are local. That's huge for me." "best around, very friendly and professional"
"Customer Service is exceptional!! They were able to squeeze in immediate service on my vehicle without notice. Would recommend them without question!" "I always find Breezy Point to be accommodating and fair without telling me about unnecessary repairs." "It's one of the cleanest auto service I've seen. They are kind enough to drive me back to my office while fixing my car. I'm very satisfied with quick turn around." "I have been servicing my Ford at Breezy Point since 2014; from tune ups and basic maintenance, up to major repairs. The customer service and quality of work is excellent, friendly and knowledgeable staff. The repair estimates are very accurate, no hidden cost or surprises. I would recommend Breezy Point to anyone who wants quality repairs done in a reasonable time frame." "I have in fact referred others to Breezy Point based on their great customer service and quality work." "I would tell them to pick up the phone and make an appointment right away! Excellent service; clean, friendly, knowledgeable, helpful." "I went to Breezy's for a safety inspection on a used car I was thinking about buying. I was completely impressed with the thoroughness of their inspection. In my opinion, Breezy's saved me from making a $7000 mistake. Breezy's has earned a new customer and I will definitely be going back for any service my cars may need in the future." "very good service, honest, fair and reliable...."
"always done with regard to quality." "Great staff, repairs done thoroughly and in an expeditious manner." "I would tell them that it is a wonderful shop with fair prices, friendly staff, and great turnaround time." "Excellent honest auto shop. Gary was great"
"i would recommend them highly. As a matter of fact,if my other car wasn't under warranty,i'd be taking it to Breezy Point for servicing." "ur...very friendly, know your name and are timely in finishing your car...car is now in perfect condition"
"Excellent and I recommend them. I trust they won't rip me off." "They have the knowledge and the modern equipment to take the guess work out of diagnosing problems." "excellent,very thorough evaluation of entire vehicle. Found problems I didn't even know about and fixed.Probably avoided several future visits to repair them.Also found things I had problems with but forgot to mention since they were intermittent.Thoroughly explained all their work.Nice people"
"Gary and his team are exceptional and extremely trustworthy - we would never go anywhere else." "The quality of work and customer service is excellent. always pleased"
"Always very professional and courteous, knowledgable and are very attentive to customers concerns." "ALREADY HAVE HIGHLY RECOMMENDED BREEZY POINT TO PEOPLE." "EXCELLENT!!!!! You can trust Gary and his team completely that everything will be done right and that they are honest and wonderful to work with"
"Very good service, and workmanship"
"My recent experience with Breezy Point was the same as all previous visits: the caliber of the work is superb, the service is personal and friendly, and the prices are quite reasonable. Go to Breezy Point if you're looking for top-notch mechanics and personable staff at a fair cost." "Reliable information given and great customer service." "We are relatively new to Breezy Point. We found Breezy Point through word of mouth from other satisfied customers. They are thorough, informative and timely in relaying repair information, drop off, pick up, estimates, etc." "they got me in for same day service and my vehicle was repaired in a few hours. professional service. i was very happy with the service performed. gary is a great guy." "We have been taking our cars to Breezy Point for many years and have been very satisfied with the shop in every way. We have found them to be honest and competent, and their prices are fair. When someone from Breezy Point tells you something on your car needs to be repaired or replaced, you know that you aren't being taken for a ride. On the rare occasion when something wasn't done right the first time, Gary, Gail and the staff at Breezy Point t have gone out of their way to fix the problem as quickly as possible. Everyone at Breezy Point is very professional and courteous, and they take care to explain what is wrong with our cars and how they will fix them. After my most recent oil change I was very pleased but not really surprised to find that they had cleaned the inside of my car. I wish that every business I deal with gave first class customer service like Breezy Point does." "Very good quality work always there for you"
"They are a very deprndable and quality Auto Repair establishment." "Fantastic service and excellent workmanship. Honestly people who take pride in their job. Could've not have been more knowledgeable or professional!" "Highly reccomended and service is excellent"
"Very good customer service, kept well informed, and all necessary repairs were outlined to me before hand with itemized costs for each repair. Total cost of repairs came within $10 of original estimate." "Good customer service and quality of work as well. Nice integration of online for making appointment." "I would definetly tell them to go there." "Breezy point is honest and fair to their customers. They are friendly and assist you if you need a ride home I have had good experiences with them and highly recommend them"
"They are the best! Professional and reliable." "Best auto repair shop I have ever found. Breezy Point staff is very helpful and every interaction I had with the staff I was treated like family. They are honest and take care of your vehicle like it's their own. I will be taking both my of vehicles he from now on." "Mr. Schmalle we couldn't thank you more for the awesome review. Your right, our customers are our family. Thank you. "Breezy Point Auto Repairs' service was outstanding! I was highly impressed with the teamwork of the technicians, their professionalism and courtesy. I would highly recommend Breezy Point." "Thank you Kathy for the great recommendation. Were just a call away. "That Breezy Point notifies you of work that needs to be done and gets your okay. The service is excellent, as is the quality of work. I have been very pleased with Breezy Point." "it is truly customer service at its best!!!!!" "They were prompt to respond to my call even though I wasn't a regular customer. They told me what needed to be done and estimated the cost to complete the repair. They were also very accurate with their estimate." "Breezy Point is a good place to have your car serviced." "I tell them about everyone who I work there and how much they care about getting things done on time and keeping you informed about what needs to be done." "I would recommend the shop. Friendly staff, professional and quick service." "Very knowledgeable and courteous. Customer friendly and always back up their work." "Very knowledgeable and customer friendly, and always back up their work"
"they explain everyting that is wrong with the car in a way that you can understand, friendly, and knowledgeable, garage clean and everyone most pleasant..."
"Small family feel, people seem honest"
"The service is excellent. They proactively look for things that might be or go wrong to protect your investment in your vehicle. They provide a fair and accurate Quote. Their prices are fair. Service is performed in a timely and responsible manner. The staff is respectful and courteous. It does not get any better than this !" "Not only is the auto service great. But the customer service make you feel right at home." "Everyone at the Breezy point Auto Repair facility are great to work with. They tell you up-front what your vehicle needs and give you a very close estimate before the work is begun. After the work is completed and you have the vehicle a couple of days they follow-up to check if you are satisfied with the work performed. Customer service is important in today's' business climate to keep clients coming back and I like their program." "We would tell them that Breezy Point is totally trustworthy, reliable and very courteous. You cannot say that very often, but Gary and his staff are one of a kind - EXCEPTIONAL!!!!" "Worker are conscientious and the work is done right. They do not rush through any explanations and are trustworthy." "Go there you will be satisfied! Honest up-front quotes given to you before any work is performed.Better price than you would receive at a dealer for great results." "Thank you Peter for your kind words. It has been a pleasure as always!" "Excellent shop to take your vechicle to for repairs. I have recommended Breezy Point to others." "I would say that everyone is very professional and very friendly. I was able to ask questions about the repairs needed on my car and not feel "stupid" about asking mechanical questions, which I know nothing of. I liked that I could trust them and they could trust us. I would definitely recommend this service shop to my friends. <3"
"Top-notch service, friendly staff, quality work. They go out of their way to help. I often recommend them to others with confidence." "I like there service and work. I like the fact that they contact me to let me know the cost of repair and ask my permission to continue on to the repair. I recommend this place." "Breezy Point is a reputable business who do excellent work and they treat their customers like friends." "Make the call! They are the best!" "The customer service and the quality of the work has and is A1. I have never had ant doubt that they go the extra mile in all areas of repair and service." "I would say that Breezy's work is high quality and their customer service is excellent"
"They have been servicing my vehicles for 10 years and I never had any problems. Very customer focused with effective communication skills." "Breezy Point is a place of business where one feels very welcomed. We were treated with respect and given the attention on questions that were asked about the job being done on the cars." "excellent customer service - good reliable and honest service - would reccomend"
"My service repair was completed accurately and in a timely manner. A courtesy check revealed other potential repairs which I approved. Upon completion, my vehicle was delivered home in a snowstorm. It was a pleasure to deal with Gary and his staff!" "I can't judge whether the repairs to my car were done well, as I know nothing about cars. What I do know is that the repairs were done quickly -- for the amount estimated -- and the car runs. I received a phone call from Jules, who explained in detail what had to be done to the car to made it road-worthy, and how much the work would cost. I was ferried to and from my home three or four times while my car was in the shop, as I has no way to transport myself. When my car developed another issue the day after repairs were finished, every effort was made to assure that I was back on the road as quickly as possible. I can say with certainty that the service at Breezy Point far outshines that of any other repair shop I've used in the past. The cost of service seemed competitive." "Very knowledgable and courteous, Always stand behind their work"
"The shop is reliable and trustworthy. They know the business." "GREAT AUTO SERVICE. REALLY CONCERNED WITH THE QUESTIONS THAT YOU ASK ABOUT YOUR REPAIR." "I would recommend you with out any reservation. I do wish that you would go beyond Stratford for pick up or drop off of customer." "I had a great experience with Breezy Point! Every one is courteous. Gary explained step by step the process used to resolve the issues with my car, as well as the cost involved. Left no surprises.. After many attempts to fix my car at other mechanic shops Breezy Point solved the problem..The staff is honest and trustworthy and I couldn't be happier. I would recommend them to anyone." "Customer service area and garage is very clean. Service is great and close to my home. Work team is very professional and on top of preventative measures. Very happy customer. The car is 15 years plus and because of Breezy Point the car is still rides smooth." "The management and employees of Breezy Point Auto Repairs are very realiable and an excellent groupof people to deal with, and they are very customer oriented." "Best around. Most honest and knowledgeable"
"The service and customer care are outstanding! I can always depend on them to get my vehicle in and out with no delay." "Trully worhty of a try very profesional people"
"I would highly recommend Breezy to family and friends. They are reliable, honest and I have never had an issue with having to bring back the car because the repairs weren't done correctly." "I would highly recommend Breezy Point. I have been bringing my cars there for service since moving into the area and I have always been satisfied with the service done and with the explanations given to me for the service needed to be performed. The staff is always courteous"
"Friendly staff and work gets done in a timely manner." "Excellent customer service in all respects." we look forward to seeing you again soon...."
"I highly recommend Breezy Point Auto Repairs for all vehicles. Their work ethic, cleanliness, reliability and knowledge is unsurpassed."